This week has been huge! First of all, Deedy (that's Dorothea Jensen to you) recorded all three Izzy Elf story poems at Rocking Horse Studio. Soon there will be audiobooks of all of 'em: Tizzy, the Christmas Shelf Elf, Blizzy the Worrywart Elf, and Dizzy, the Stowaway Elf. Deedy had such fun reading these. You can see she did by looking at this picture of her in her Princess Leia earphones! These audio recordings will soon be available at Audible.com and maybe some other places, too! The big news at the North Pole itself (in the Izzy Section, of course) is that Santa gave Deedy permission to tell Dizzy's story (I knew something like that was up). She has written it all down, and has made an audio recording of that, too. It is called Dizzy, the Stowaway Elf. I read it the other day and felt a bit guilty, because apparently what made Dizzy stow away was hearing me tell about my own Big Adventure. I'm so glad it all turned out well, since it was kind of my fault it happened in the first place. Also, Blizzy just reminded me to tell you that her story is also now recorded. BLIZZY, THE WORRYWART ELF tells all about what happened at the N.P. while I was gone. I loved reading about how she figured out what happened to me. She is extremely clever (and very pretty, too). 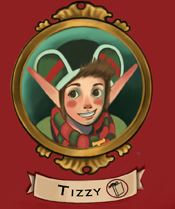 My final piece of news is so EXCITING: Michelle Alfonso finished almost all of the pictures for my story, Tizzy, the Christmas Shelf Elf! They are FABULOUS. My only problem with them is that I look cross and worried in just about all of them. Of course, who wouldn't look cross and worried if he was trapped in a Christmas present and ended up thousands and thousands of miles away from home with no way back? Alex and Owen, the wonderful boys who try to help me, look pretty worried in the pictures, too. Sometimes they even look scared, like when they think their dad might have thrown me into the...oh, never mind. You'll have to read it to find out. Soon you'll be able to to do just that: an illustrated Kindle and print version will be ready VERY, VERY SOON!